Sunday, June 19, Lake of Mont Charvin (60 km from Geneva). 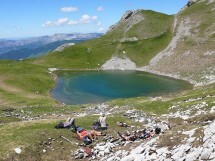 This natural lake is located in a beautiful circus at the foot of Mont Charvin (2,409 m). For experienced hikers. Very nice view of the Mont Blanc from the edge of the Goenne hundred meters above the lake. Note that the path follows the sources of Fier. A gradient of 800+100 m and a distance of 10 km. Walking time: about 6 hours.